Iran-backed pro-Assad militias retreated back to regime-controlled areas after the Turkish military started shelling a convoy as warning, which was 10 kilometers (6 miles) from entering Afrin to fight alongside the PKK terror organization's Syrian affiliate the People's Protection Units (YPG). 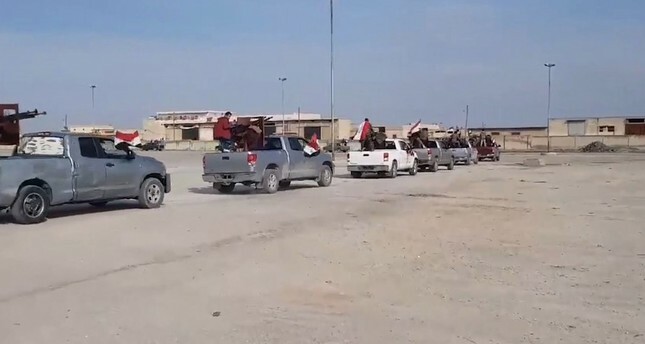 Syrian State TV reported about 20 vehicles with heavy machine guns mounted on them entering Afrin from the nearby villages of Nubul and Zahraa with scores of gunmen were on the vehicles waving Syrian flags and chanting pro-Assad slogans. Anadolu Agency and sources on the ground said the convoy was forced to retreat back to Nubul and Zahraa after the shelling. On Sunday, a senior YPG official told Reuters that the group had reached a deal for the Syrian army to enter Afrin and that it could be implemented within two days. However, the deal was denied a day after by a YPG spokesman Nouri Mahmoud, saying there was only a call from the terrorist group for the Syrian army "to come in and protect the borders." The Turkish foreign minister warned the regime against entering the Syrian town shortly after Syrian state media said pro-regime forces would enter Afrin "within hours" to "bolster" local forces in confronting Turkey's Operation Olive Branch after reaching an agreement with the YPG. President Recep Tayyip Erdoğan also held two separate phone calls with his Russian counterpart Vladimir Putin and Iranian President Hassan Rouhani to warn against such a move.